The spider is widespread in southern Britain, but becomes very locally distributed in the north. It is widespread in western and central Europe. This species produces a very simple, often H-shaped web, usually close to ground level. It is found in a wide variety of habitats from coastal shingle to mature woodland, but especially in marshes and tall grassland in damp situations. 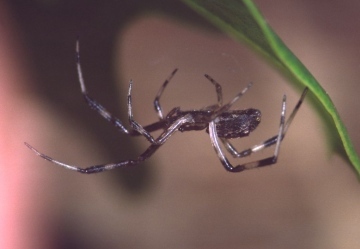 The spider sits on its web and uses its legs to tension the silk strands attached to the ground (or other substrate). Crawling insects are caught on this viscid, tensioned silk. Both sexes are mature in early to mid-summer with a peak in May and June, females persisting occasionally until September. Generally an uncommon species, but it may be numerous in suitable habitat.